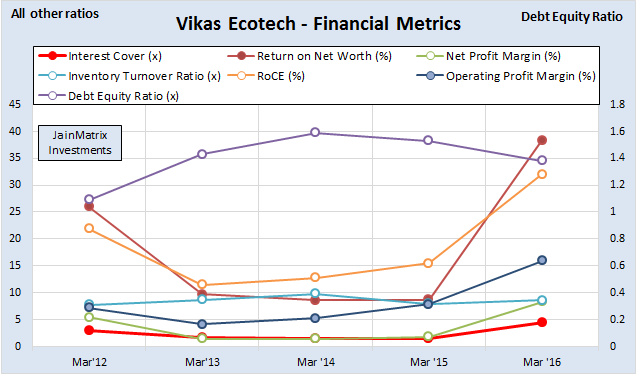 Overview: Vikas Ecotech is engaged in mfg. and trading of specialty chemicals. It has factories in Shahjahanpur (Raj.) and J&K. The FY’16 revenues and profits were Rs 312 cr. and 26 cr. and these have grown 21% & 29% CAGR over 6 years. Products are niche, high value and eco-friendly, many are import substitutes. Exports are growing and are 49% of revenues. Current operations are lean. Why buy now: VET is commissioning new plants in Noida SEZ, Kandla SEZ and Dahej (Guj) as well as extensions at Shahjahanpur. It expects a revenue growth of 35% CAGR in the next few years as outlook is strong. Key risks: 1) Competition from large Indian players or Chinese firms can affect business. 2) The raw materials for VET are crude derivatives and any rise in crude oil prices will increase input costs. 3) VET has been free cash flow negative for 5 of the last 6 years. This has raised debt. The Target Price is Rs. 52.7 by May 2019, a growth of 143% over 25 months. This is a High Risk but High Gain opportunity for aggressive investors. 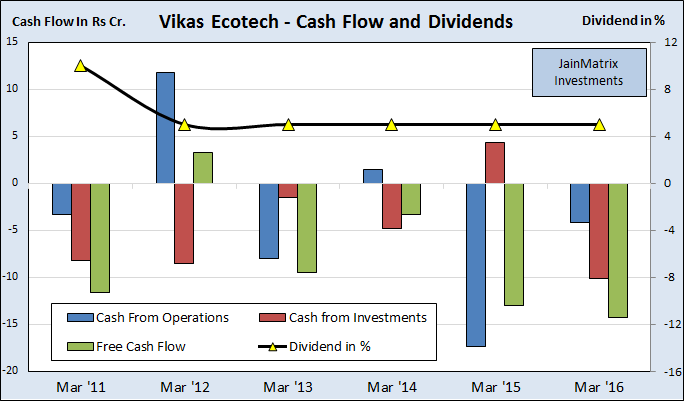 Here is a note on Vikas Ecotech Ltd. (VET). VET does mfg. and trading of specialty polymer compounds & additives like Polymer compounds, Organotin stabilizers, Plasticizers and Flame retardants. The FY’16 revenues were Rs 312 cr., profits Rs 26 cr. and market cap is Rs 610 cr. Located in Delhi, VET has factories located in Shahjahanpur (Raj.) and Samba (J&K). VET started as a trader/ agency for chemical products, then expanded into mfg. VET has 250+ work force and products are exported to 20 countries, like B’desh, Pakistan, Sri Lanka, China, UAE, Turkey, Spain, S’pore, Germany, Ukraine and USA. Specialty Additives – toxin free high perf. additives for mfg. applications. Plastic Compounds – polymer compounds like Thermoplastic Rubber (TPR), Thermoplastic Elastomer (TPE) and Specialty compounds of PVC, PET and EVA. Recycling – It recycles material to create virgin-grade PVC compounds. Clients – RR Kabel, Relaxo F’wear, Liberty, Escorts, KEI, Havells, Apollo Pipe & SRF. In FY15, VET sold stake (and exited) from a subsidiary, Moonlite Technochem. It also acquired the balance 25% stake of Sigma Plastic Industries thereby having 100% stake. By Q4FY15, VET became a standalone firm without any Subsidiary. In 2015 the firm rebranded itself from Vikas Globalone to Vikas Ecotech Ltd. Leadership team is Vikas Garg (MD), Vivek Garg (Dir. ), Ashutosh Verma (CEO), and Pankaj Gupta (CFO). Vikas Garg has been with VET (group) for 18 years and provides hands on leadership. Shareholding % is: Promoter and Group-41.6%, Institutions-29.25%, individual-8.9%, others-20.25%. VET commenced construction of a mfg. plant and R&D center at Dahej, Gujarat. It will provide import substitution for additives and stabilizers. The plant will add capacity and produce 6,000 MT of organotin stabilizers (methyl tin mercaptide or MTM) and 5,000 MT of specialty polymer compounds annually. The plant cost is Rs. 30 cr. Production was to start by Apr2017, but a delay in environmental clearances may delay it by 6 months. VET is also setting up plants at Noida SEZ and Kandla SEZ Guj. as well as extensions at Shahjahanpur (Raj.) to handle higher volumes and get exports benefits at SEZs. Prince Pipes and Fittings Pvt Ltd’s CMD, Jayant Chheda, and his associates have acquired, in their individual capacity, 2.63 crore shares of VET or over 8%. PPF is a strategic customer of VET. The funds received of Rs 34 cr. are to be utilised for expansion of R&D facilities, new plants and marketing for domestic and exports. VET formed a strategic tie up with PPF, India’s 3rd largest PVC pipes mfg. firm for supply of specialty chemicals to replace current with eco-friendly variants. VET produces Organotin Stabilizers which are required to produce Lead free non-toxic, safe and eco-friendly PVC pipes. It’s a valuable tech. available with only few producers worldwide. VET aims to produce bio plastic by using waste cooking oil through a technology called Wastol-P, and grow as one of India’s leading eco-friendly firms. It has entered into a contract with Haldiram, the large snack mfg. for supply of waste cooking oil. Exports may grow around 30-40% for FY17. VET expects revenues to grow 35% CAGR for a few years, as per management. VET’s mfg. plant in Raj. was affected by a fire in Apr2017. But damage was limited to only one building that housed the polypropylene section and a material warehouse; 4 other units in the same factory are safe and fully operational. The unit contributes 3% to sales. It may take 4 months to restore full production. According to estimates, damages could be Rs. 15-20 cr. but the factory is fully insured. During the current year VET’s market share in India for Organotin Stabilizers was 10%. Their vision is to attain 25% share of the expanded market in the near future. VET allotted 2.56 cr. equity shares of Re 1/- each at a premium of Rs. 16/- in Mar2017 to non-promoters on preferential basis. Promoter holding fell 4% in the Company. Crisil rated VET a BBB for long Term Borrowings; A3+ for Short Term in Feb2017. In Feb2016 Merrill Lynch Capital Markets bought 19 lakh shares of VET. Employee strength has grown rapidly from 63 (FY15) to 81 (FY16) and 250+ today. The Indian Specialty Chemical Industry is experiencing a good growth and is fast emerging as global specialty chemicals mfg. hub. Total production was 2.1 crore tons in FY’16. Industry delivered 13% growth over the 5 years led by domestic consumption; more recently it was 30% growth over FY13-15 to $2.67 bn. India is 3rd after China & Japan in Asia and 6th globally in volumes. The Industry is expected to grow at CAGR of 15% for next 5 years. Indian specialty chemicals firms will gain over China due to strict implementation of environmental norms & safety standards there, which may lead to closure of many firms. Exports have already slowed. This may help boost exports from India. Make in India initiative will facilitate growth and flow of FDI to this sector. Indian specialty chemical firms will have 6-7% share globally by 2023, double the current level. The India demand for Organotin Stabilizers at 6,000 MT p.a. (growth 20%) and PVC heat stabilizer (60,000 MT p.a. ); and global PVC heat stabilizer market demand are growing fast, and VET expansion plans are in line with domestic and int’l. demand. This year VET’s market share in India for Organotin Stabilizers was 10%. The vision is to attain 25% share of the expanded market in the near future. See VET’s 5 year price history in Fig 3. Investors for 5 years gained by 51.4% CAGR. The share price shot up sharply in 2015. The recent one year low is Rs. 10.85 in Jun 2016, and the high was Rs 23.3 in Mar2017. The share price is 9% below this high. Dividends have been consistent for 4 years at 5% giving 0.24% yield. This is low. 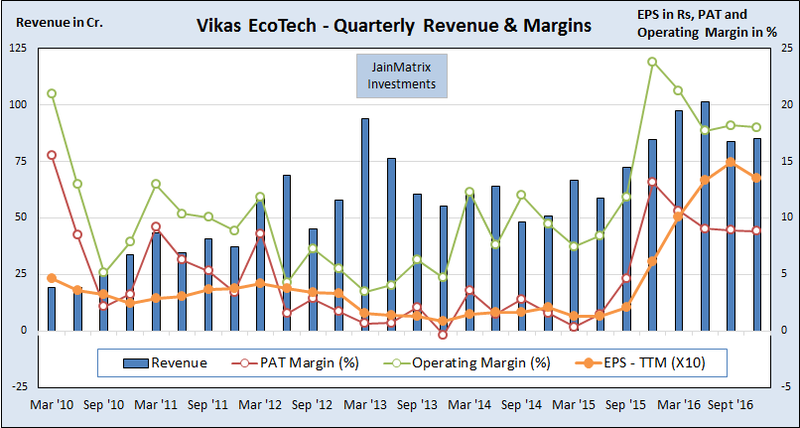 The Revenues, EBITDA and Profits have grown 21%, 35% and 29% CAGR over 6 yrs. In Q3 FY17 VET had revenue of Rs. 84.8 cr. and growth of 0.3% YoY due to demonetization and fall in trading. But the mfg. revenue grew 17%. See Fig 4. DE ratio is 1.41 which is high. VET will fund expansions through internal accruals. Note: VET data in Fig 4 is consolidated until Mar 2015 and standalone thereafter. VET has weak cash flow position. It has been FCF positive only in 1 of last 6 years. This is a negative. See Fig 5. However the reason is investments in R&D and mfg. capacities. The firm raised funds through preferential stock issue and promoter holding dilution. As a result the debt position is still moderate. In Fig 6a, the 6 year PE chart for VET has a historic average PE of 15. Current P/E is 15.74 times (TTM earnings), while the P/B is 8.25 times. In Fig 6b we see that EPS TTM had an upward trend in last 2 years in a channel. But in Q3FY17 there was a drop due to challenges like demonetization. The DE ratio reduced in Mar’16, Fig 7. Interest coverage ratio improved. The inventory turnover ratio rose, operating & profit margins are higher, ROCE doubled to 32%. Similarly RoNW. These are positive. Beta of the stock is 0.93 (Reuters) which is indicates low volatility. In a benchmarking exercise we compare VET with listed peers in similar businesses. 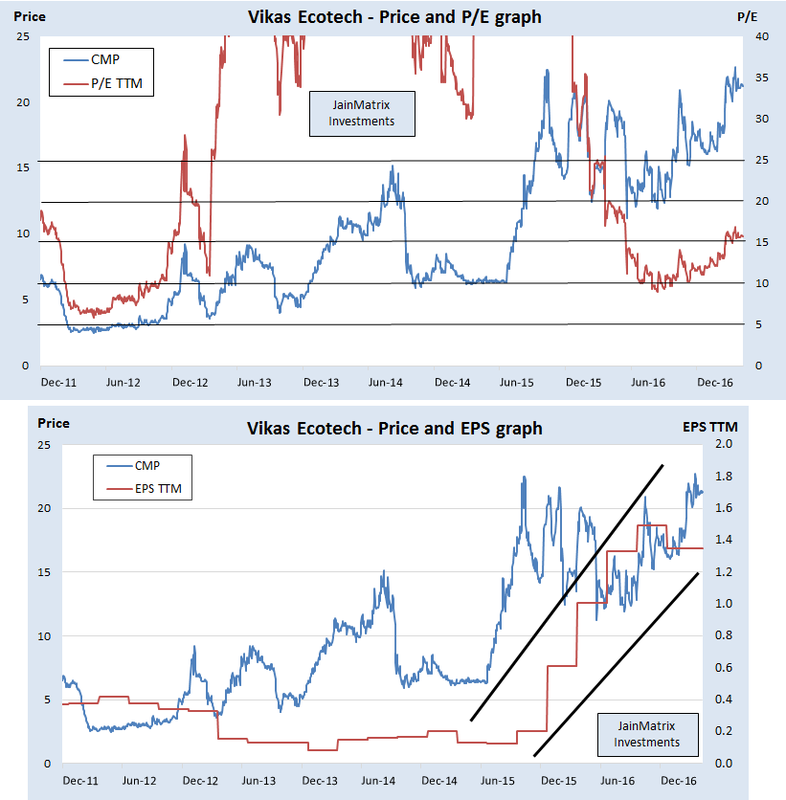 In terms of valuations, VET has a low PE ratio in spite of a recent rise in the share price. However P/B is high at 8.25 times. VET has the lowest dividend yield, however this is OK for a high growth company. D/E ratio is high among peers, however it is at manageable levels. VET’s 3 year CAGR PAT has grown at 86.8%. This is good, but on a small base. VET has return ratios over 35%, that are likely to sustain. This is excellent. The numbers show that the firm that is moving to a high growth / high profit phase. The financial projections have been made based on following assumptions. Production starts at Dahej plant in mid FY18 and ramps up to full capacity in 2 years. Noida and Bhuj plants too start contributing to revenues in FY18. Exports and domestic demand continue to grow at a combined 30-35%. R&D continues to develop new products; demand for lead free chemicals grows; eco-friendly mfg. processes for PVC compounds from recycled materials gain in visibility and demand. Good R&D that works with prospects and customers to develop new products & solutions. The recent revenue upswing was the result of years of R&D work. Capacity additions will start from Dahej, Noida and Bhuj plants in FY18. A domestic focus on substitution for expensive imported niche chemicals. Exports focus will continue and build on the current 49% share of revenues. There exists a good synergy between trading chemicals business and mfg. Remarkable cost consciousness including salaries for promoters and employees. Current customer base is derisked across a large number of firms and industries, providing stability. The raw materials used by VET are crude oil derivatives. Any rise in crude oil prices will increase the input cost and margins. However crude is in a 45-55 $ range. VET has weak cash flow position. It has been FCF negative. The D/E ratio at 1.4 times is moderate, but any further capital raise can push D/E to excessive levels. Promoter shareholding is low at 42%. However the promoter has sacrificed holdings to raise funds for expansion. He may be in a position to raise this in a few years. He still has sufficient holdings today that provide him a good incentive to grow and develop the firm VET. In terms of valuation, the P/B ratio looks expensive. VET’s mfg. plant in Raj. suffered in a fire in April 2017. The damage could be Rs. 15-20 cr. But these assets were insured. One plant in J&K is in a sensitive area, there have been terrorist attacks recently. Chinese chemical producers can be competitive on price and volume. The other massive player in the sector is Reliance Industries. VET has potential as a niche chemicals player as long as other larger players do not enter these segments. However these segment volumes may not be attractive for RIL. VET can in future be a takeover target by large players. But it will benefit investors. VET sales are B2B, used as raw material, so it’s difficult for analysts to verify & validate output. The chemicals sector is a massive market, and specialty chemicals can be a valuable and large niche within this. India offers many competitive advantages to this sector. VET has taken this strategy and has ample room to grow in this niche. VET is rated highly on lean business operations, aggressive growth – both mfg. capacities and workforce, good R&D team, eco-friendly products and growth in domestic & export markets. Valuations are reasonable as VET is a largely undiscovered firm. With a turnover of Rs 312 cr., VET has ample room to grow in domestic and exports markets. Key risks are: 1) As VET is a small firm, competition from larger players or Chinese firms can affect business. 2) The raw materials are crude derivatives and any rise in crude oil prices will increase input costs. 3) VET has been free cash flow negative for 5 of the last 6 years. This has raised debt. The target price is Rs. 52.7 by May 2019, a growth of 143% over 25 months. The target price basis is 1) Financial projections – Exhibit 9, 2) A target P/E of 20 times, higher than current 15.74 times 3) Analyst judgement.